Why is vending a good investment? All people eat and drink foods of one description or another, and by providing vending equipment on site, you are giving your customers a convenient way to purchase leading brand products. The confectionery-vending sector is one of the fastest growing sectors of the vending industry with an annual growth rate of 12%. This growth actually increased to 15% during the recession of the early 90’s. What sort of equipment do I need to start off with? There are two types of machines the one being a snack machine, which dispenses snacks only. The other a combination machine that dispenses both snacks and cold drinks. Please note the new equipment is capable of also dispensing water, Energade as well as similar types of plastic bottles and Tetra Packs. Who will find a location? Without good vending machine locations, your vending route cannot grow. We have a professional location finding service which is avaialble to you for a nominal fee. Whilst we endeavour to provide you the best possible locations for your business, we cannot in any way guarantee the success of the location. How many sites will I need? The number of locations required depend on the number of machines you purchase. Where will my sites be? Your sites will usually be set up close to your residence or work but again we impose no restrictions. Therefore, if you wish to have your equipment sited in a different area for any reason, then this can be arranged. In most cases your sites will be located on Industrial and Trading Estates. Vending Solutions will do their best to accommodate you within a geographical area however in some instances you may have to go further to get better locations. Where do I get stock? Products can be purchased directly from your local wholesalers i.e. : Makro Trade Centre or order directly from the manufacturers. You will be trained on all mechanical aspects of the equipment, shown how to adjust the coin mechanisms and taught how to carry out routine service and repairs. We will also, where appropriate, give you advice on running your business, taking into account stock control, merchandising and product selection. What vehicle will I need? Initially a family type car or sedan would be suitable, but as your business grows and develops you will probably find it useful to acquire a small van. or trailer. 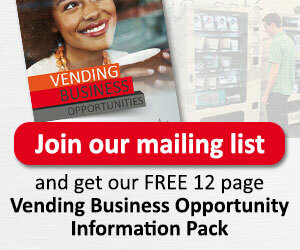 Does Vending Solutions offer any guarantees? Because the only money you pay to us is for vending machines, your investment is 100% secured against your equipment. So, should you ever wish to stop trading, you can return your money by selling your vending machines or vending business. And, in most instances, you would make a profit from your sale. In addition we offer comprehensive warranties on all equipment new and refurbished. Bear in mind that these figures are only an indication of potential financial viability and may not be achieved. Your management style and overall commitment are crucial to success. Contact the office and speak to one of our staff, we will be happy to discuss your particular requirements. If you prefer, we can arrange for one of our vending experts to visit you for an informal discussion, allowing us the opportunity to furnish you with all the details that you will need to make an informed decision for your future.